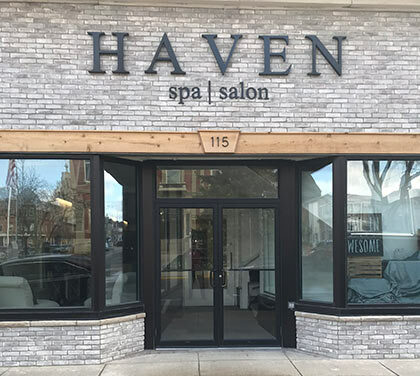 Haven Spa & Salon - a charming business located downtown Decatur first opened in June 2010 as Rejuvenation Spa & Salon. In August 2012, an opportunity arose for the business to relocate to its current cozy spot at 115 South 2nd Street! As we all need a boost and refreshment, we updated our name and remodeled with an eye catching design in late Summer 2017. Haven Spa & Salon has a lot to offer with boutique items and relaxing services. The boutique includes a variety of jewelry, clothes, styling products, essential oils, HYDE+ALCHEMY perfume and more! Our staff includes stylists, a massage therapist, an esthetician, all her to pamper! The services offered are massages, hair and nail care, a weight loss method, infrared wrap and sauna, tanning, red-light therapy, hair removal, and teeth whitening. With so much go offer it's a must visit! We have Ideal Protein weight loss method, infrared wrap, infrared sauna, full service salon, massage, manicures, and pedicures, esthetics, teeth whitening, paraffin hand treatments, and tanning. Room rentals for parties, decor for rent. Tablecloths, chair covers, and more.